Four French hikers from New Zealand got more excitement than they might have wanted on the Lake Waikaremoana Great Walk in the country’s Te Urewera National Park. 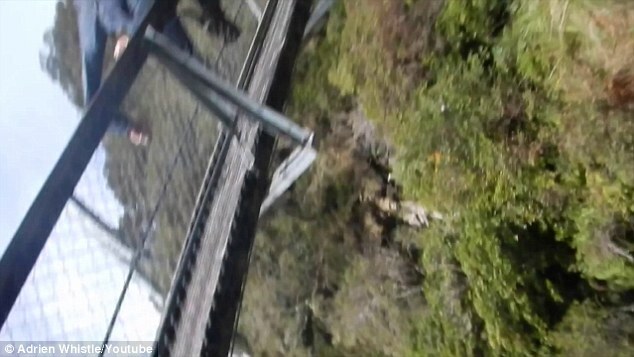 As a incredible newly released video shows, when a cable on the Hopuruahine Suspension Bridge along the track gave way, the hiking party was sent plunging 28 feet (8.5 meters) into a river below. Amazingly, none of the hikers was seriously injured. According to FOX, the fall, which occurred on September 3, is being blamed on a manufacturing defect. The bridge spans approximately 215 feet (65 meters) across the river and is rated for 10 people at one time. In a press statement, Department of Conservation deputy director general operations Mike Slater said laboratory analysis revealed manufacturing defects (known as quench cracks and embrittlement) in a section of 24-millimeter-diameter high-tensile chain used on the bridge. Slater said checks haven’t revealed any sections of the same batch of chain being used in the DOC’s other suspension bridges around the country. “This is good luck not good management. Our reputation cannot rely on luck,” Slater told the NZ Herald. New cable strops will be installed on the bridge in coming weeks. The bridge will be recommissioned after being tested. Located on the country’s North Island, Te Urewera National Park is known for its rugged mountains, lakes, forests and secluded hiking trails.